This February, Brat Haus in Scottsdale is teaming up with Grand Canyon Brewing Company in a month long fundraiser to benefit the Honor Flight Network—a charity organization that sends war veterans to Washington D.C. to visit memorials built to honor their service to the nation. 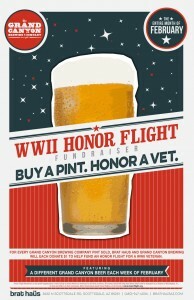 During the entire month of February, Brat Haus will donate $1 to the Honor Flight Network for every pint of Grand Canyon beer sold at the restaurant. Grand Canyon Brewing Company, which is veteran owned and operated, plans to match every dollar raised by Brat Haus to benefit the charity. Nestled in the heart of Old Town Scottsdale, Brat Haus features Arizona’s most welcoming beer garden with 28 craft beers on tap. The menu features made from scratch cuisine inspired by European food craftsmen, offering a wide variety of brats, burgers, salads and sides. The open air patio paired with delicious grub and genuine hospitality from friendly servers, makes Brat Haus the perfect Scottsdale spot for a casual lunch or dinner. Elevate your merriment by enjoying one of the patio games including bag toss, ping pong, darts and life-sized Jenga. The patio is also a dog friendly zone – so be sure to bring Fido along for the fun. Brat Haus is located at 3622 N. Scottsdale Road, Scottsdale, AZ 85251 and is open on Sunday–Thursday, 11 a.m. – 10 p.m. and Friday–Saturday, 11 a.m. – 11 p.m. Visit Brat Haus online at www.brathausaz.com to view upcoming events and for the full in house and catering menus. Also, be sure to give us a “like” on social channels at www.facebook.com/brathausaz. The Grand Canyon Brewing Company is located in historic downtown Williams, AZ at 233 W. Route 66. This family owned and operated microbrewery produces a dozen different specialty craft brews each year. While in the Williams, AZ area, patrons can enjoy Grand Canyon Brewing’s hand-crafted beer at the Cruisers Route 66 Café located next door to the brewery. For more information about the Grand Canyon Brewing Company, visit online at www.grandcanyonbrewery.com and be sure to “like” us in Facebook at www.facebook.com/grandcanyonbrewery. Next → Next post: The Wise Scottsman Takes 5th in Cider Shake Contest!